This is another Chas Haworth drawing from the 19th century. 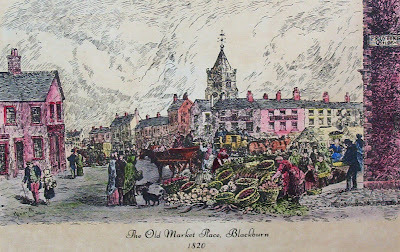 Before Blackburn market moved to a purpose built area in the 1840's, it was held in the vicinity of Darwen Street (as above) and had been held there for a couple of centuries or more, according to the history books. In the centre of the picture, you can see the tower of the Parish Church and in front of that, the Old Bull Hotel (an earlier structure than the one elsewhere on the blog). Where the 'Printing Office' sign is on the wall on the right, is where the bank was built. On the extreme left, the man and child would be heading into what became King William Street and the street which is pretty central, is Church Street. 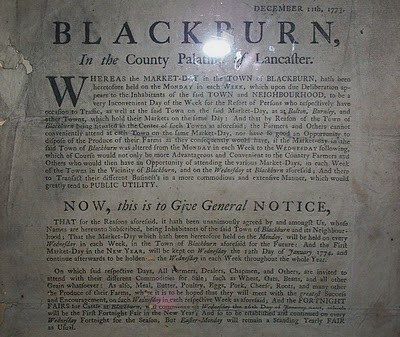 Below is a wall poster from 1773, announcing plans to move the main market day from Monday to Wednesday, which they did in 1774, and Blackburn has had a market on Wednesday's ever since.